I’m old enough to remember the last time that embroidery was “a thing,” and I’ve still got the overalls and chambray shirts covered with chain-stitched butterflies and French knot flowers to prove it. So it’s been a real pleasure for me to see the revival of interest in embroidery, along with all the lovely new threads, needles, and other tools that go with it. While embroidery’s great any time of the year, it’s especially perfect for travel. With summer vacation in full swing, several of Moda’s designers have offered to share tips and tricks for taking embroidery on the road. First up are Barb and Mary of Me and My Sister Designs. They have been traveling big-time this summer, teaching in Australia (you can see photos of their adventures via their Instagram account). Before they left, Barb was kind enough to share some tips. I found this wonderful 3 pocket zipper case a few years ago and it’s become a favorite. I may have found it at the container store but I really can’t remember. 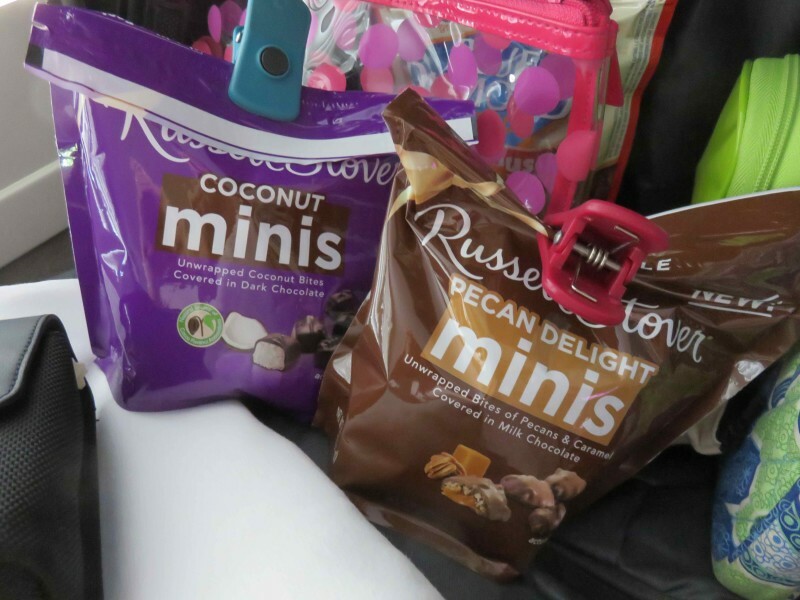 It’s compact and slips into my carry on tote bag perfectly! The second pocket holds my supplies. My hoop, scissors and a small needle case made for me by Karla at Sweetwater!! And we can’t forget these!! 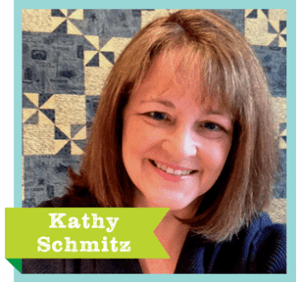 Next up is Kathy Schmitz. The thought of idle hands while on the road sends chills down my spine. I might not remember to bring my toothbrush, but I will ALWAYS have a project to work on. If it’s going to be a short day trip I will pack up my little Bunny in the Briars notion keep. 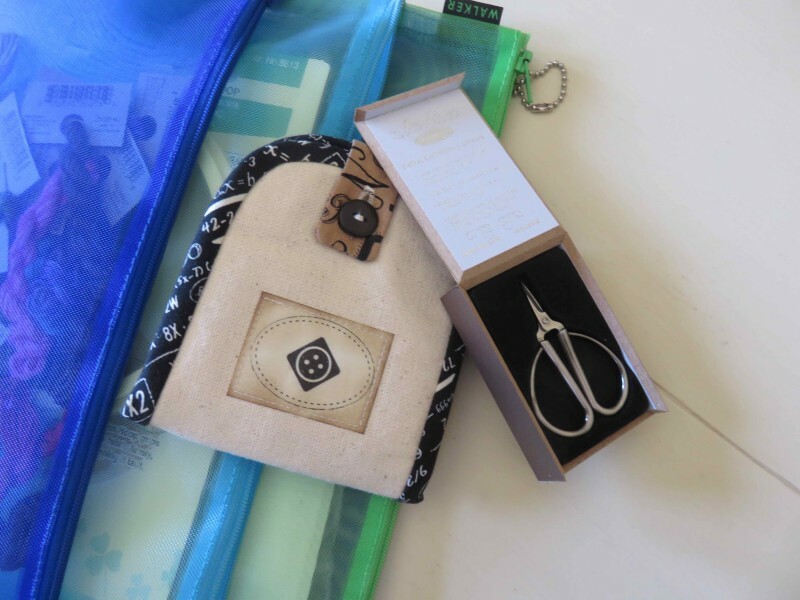 Scissors, needles, thread and project all fit nicely in the zippered pouch. However, if this is a trip lasting more then a few hours, this little pouch won’t be big enough. I have a fear of running out of things to do, so typically I overpack where projects are concerned. 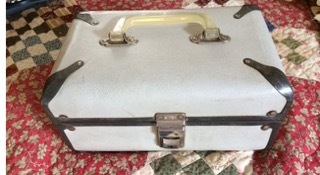 For major road trips I bring a little suitcase just for projects. I feel like Mary Poppins with all the stuff I can cram inside! The only thing missing? 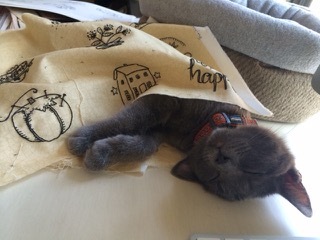 My favorite stitching companions… my kittens Sammy and Sosie. Sammy likes to chill under works in progress. 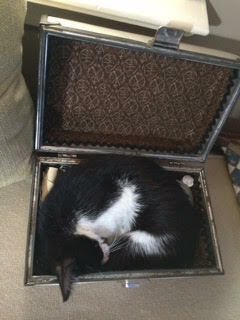 Sosie thinks the suitcase is a perfect napping spot for her. Remember, it’s better to have too many projects then not enough! So pack freely! 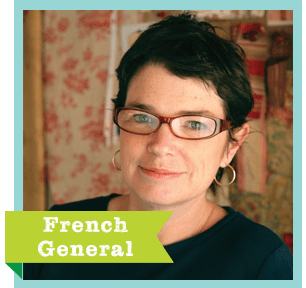 Finally, let’s hear from Kaari Meng of French General, who has been doing her stitching in France. Ever since I can remember I have loved taking needle to cloth—it is something that I can do anyplace and take anywhere! 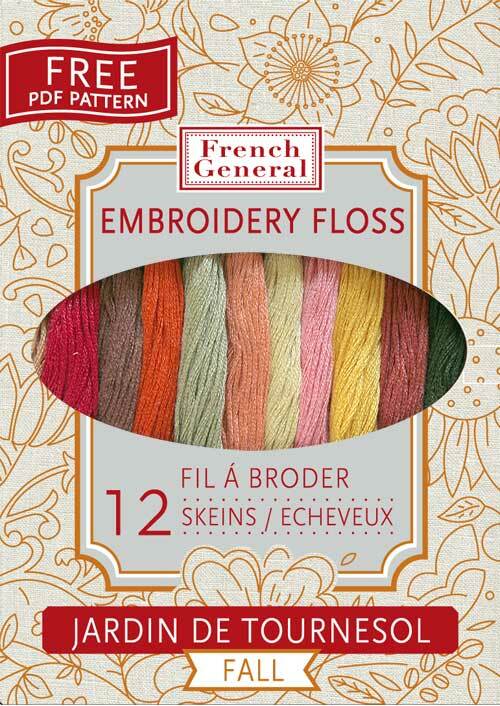 This past year French General began designing stitching samplers, as well as a collection of embroidery floss for Cosmo Threads. 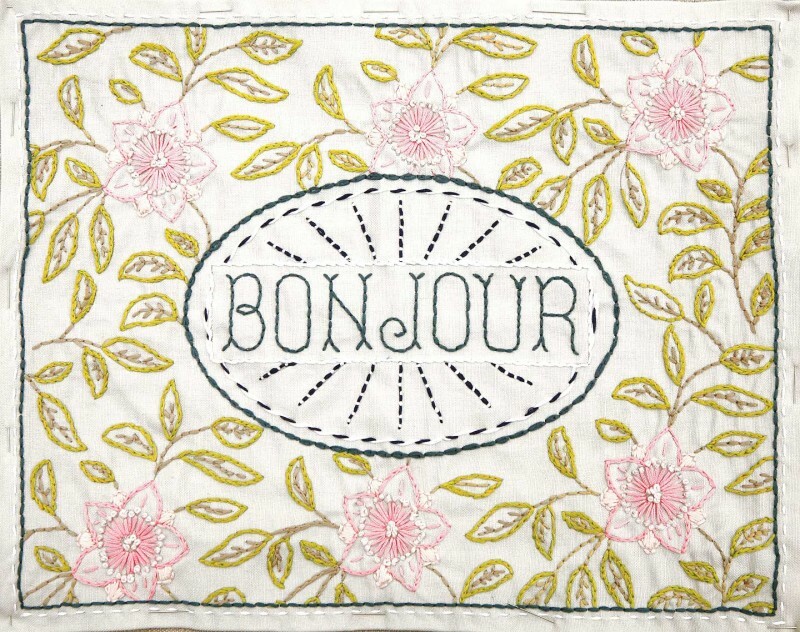 Our Chateau Getaway trips to the south of France every summer have us stitching in all the small cafés and bistros…while sipping a café au lait! So, how about you? Do you take embroidery along when you travel? Have any hints or must-have products to share with us? Happy trails! Next Next post: July. Christmas. Ready. 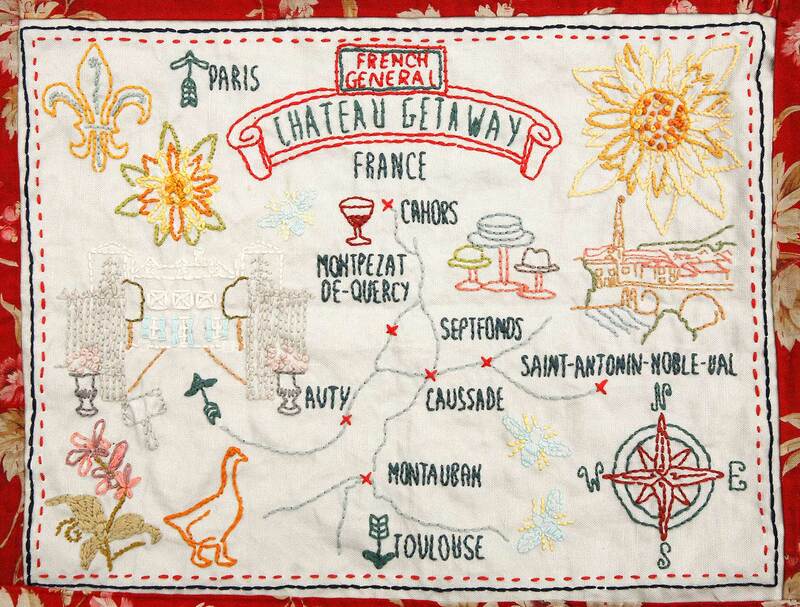 Great posting filled with good travel hints for hand embroidery. Thank you. Smart post! I love to take handwork with me while traveling too. While it’s not always embroidery (it may be wool applique, knitting, hand quilting), I do agree that it’s better to have too much than too little. You know what they say about idle hands??!!??? Hahahaha!!! As a new bride, 49 years ago, I enjoyed teaching myself to sew and knit, and learning all the needle arts. I stitched quite a few crewel projects, mostly as gifts, and one still hangs on my wall today. Then there was needlepoint, again mostly for gifts. 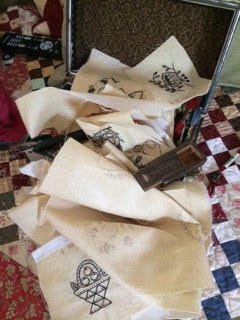 I also stitched a large stamped Sampler which has become an heirloom as I have handed it down to one of my children. Probably the one type of embroidery that lasted the longest for me is Counted Cross Stitch. I’ve made wedding samplers for my children, and oh so many gifts. Since I was a stay at home Mom, I was able to sew during the day and at night I would sit in front of TV with my either embroidery or knitting. 30 years ago I also started teaching myself quilting, and many (at least 100) quilts later, I still spend my days either sewing or quilting, and my evenings doing whatever handwork needs doing. Now, I won’t apologize for the length of this Comment, but I must tell you that reading this Post has stirred some old feelings in me to get back to some unfinished pieces of embroidery. At least 3 come to mind. So thank you for this and now, I’m itching to get back to those UFO’s so gently tucked away in my needlework basket. Oh, almost forgot, if any time in the car is at least an hour, I always have some kind of handwork with me. Usually it’s knitting because I don’t need to be constantly looking at it. Rachel, what a wonderful comment. Thank you for taking the time to share it with us. My pleasure! There is no subject (except for my grandkids) that I enjoy discussing more than any needlework! I just made myself a couple of zippered pouches to carry around my EPP projects. Two different sizes, so the smaller items like the needles, small scissors, etc. can go in there, and then the pieced items in the next one, and they all go into a fabric basket with handles that I made. I made that basket for no reason, just wanted to learn how. It sat there for a few weeks until I realized what I could use it for. I LOVE containers of any kind, fabric, tin, basket, pouches, totes, you name it, I use it! Meant to leave this under Helen LeBrett’s comment. Sorry. I use a quilted satchel I bought at Joann’s a long time ago. It looks like they might not sell it anymore, but it wouldn’t be impossible to make. 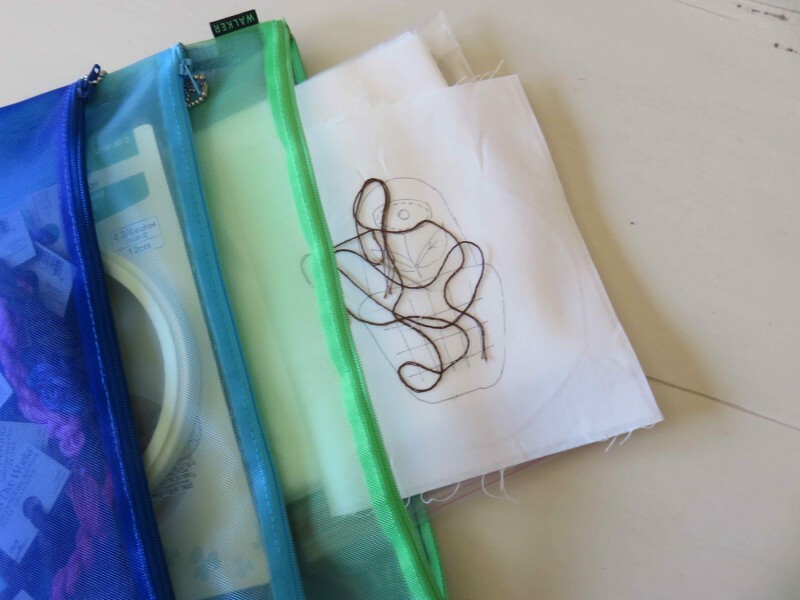 It’s kind of like a looseleaf notebook (but soft sided) with a zipper, but there are sideways pockets on the inside of the front and back that are perfect for protecting the project and holding hoops, etc. 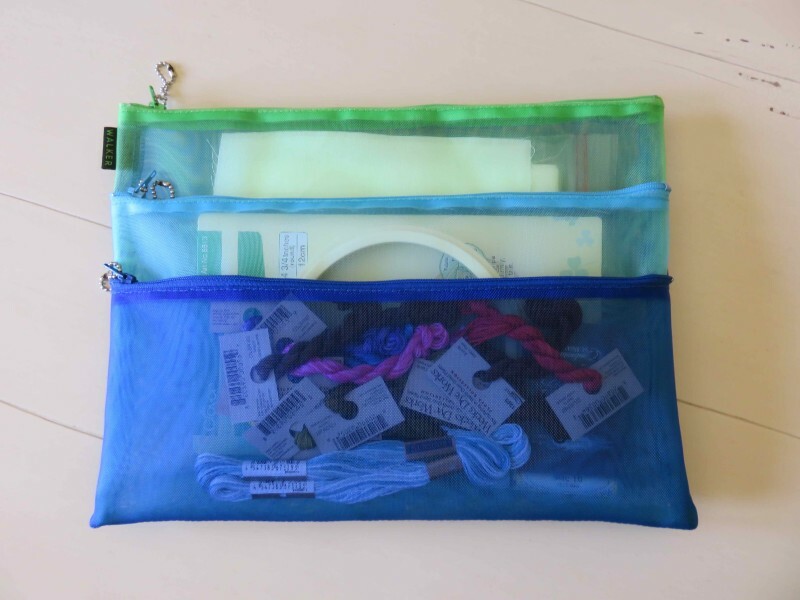 The small rings sewn into the middle can hold various types of organizer inserts for floss and notions. Hi Chris K. I may have the same one. Do you remember if it was made by Debbie Macomber? It was, I believe, made for knitting projects, but you could really use it for most anything. In fact, I totally forgot I had that. Downstairs in a chest with a few other UFO’s! Thanks for the ideas ladies: I’ve been trying to figure out a needle work bag that would be just right and you have given me a few more ideas: someday I’ll get it finalized and made!! 🙂 And could you do a post or note from Kaari Meng to tell us where we could get her floss? Thanks so much!! Wonderful post! I always take a hand embroidery project with me. It is fabulous how much stitching can be completed on either a short trip or a long trip. I really like the variety of styles that each stitcher stores their supplies in for the road trips. Thank you for sharing and have a wonderful creative day! 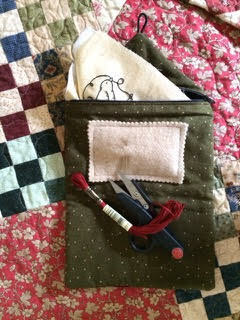 I grab my pouch with my, Quick Yo Yo maker, 5 in charm pack, needle, thread and scissors and I am ready to make Yo Yo’s. Crochet is my next carry on project. I also have a small LED lamp in my travel bag in case the lighting is poor. I have a clip on book light for the smaller bag and a flashlight size with a swing-up light bar for the slightly larger bag. The size of the bag depends on whether I am flying or driving. I have a little quilted bag that was meant for a notebook computer that contains a hand piecing project and an embroidery project plus basic tools for plane travel especially between Australia and the U.S. 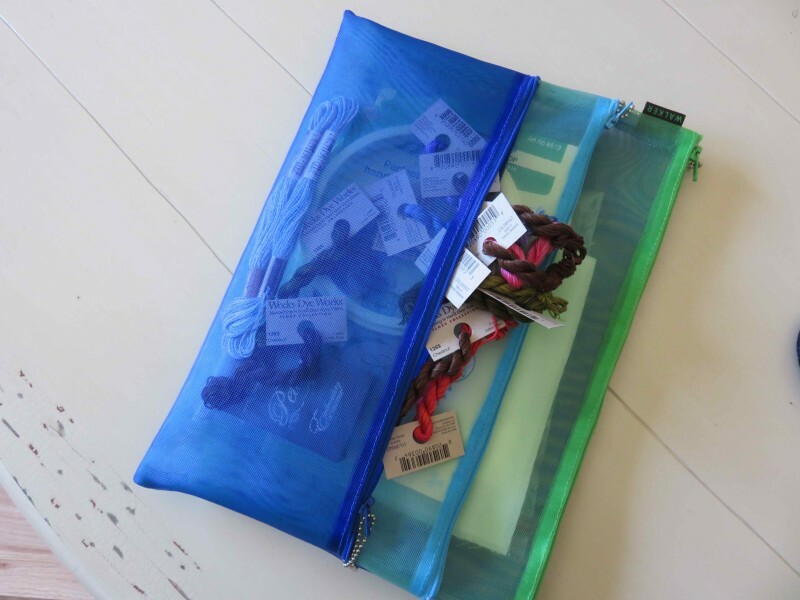 It fits in a slightly larger project bag with a few extra goodies for shorter trips or car trips. It is always ready to grab when needed such as stitching sessions with friends. A small lamp is a fantastic idea! I’m glad you mentioned it–just in time to take one on my upcoming vacation! I love your blog/posts and the many things (and products) your share – thank you! I, too, love many forms of needle arts and embroidery is one of them. I love to do English smocking and when my kids were little, I made many things for them – now I am reliving it again as I smock for my grandkids. It’s great to see various kinds of containers and pouches to keep supplies in. 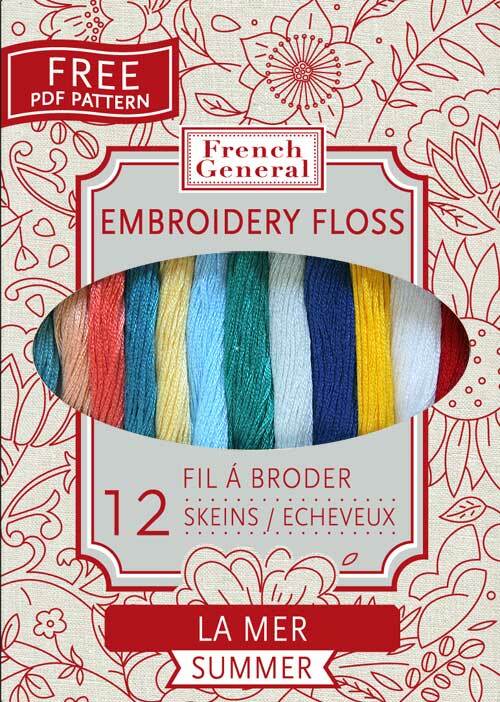 I had no idea French General had designs and I love them too… I can see more projects to add to my to-do list! Exciting! I remember learning hand embroidery to dress up jeans jackets and patch places on frayed jeans. I didn’t wear much of it, but my sister benefitted nicely. She also managed to wear the first shirt I made that I couldn’t wear because I could see the flaws. In the many years since, I have taken embroidery on the road a good bit. Now, I typically take knitting and/or crochet. I love to do hand work on the road but since I am the principal driver in my family not too much gets done. I have a hexie project going that I figure will be 5 years to finish and inspired by my friend Vicky’s Santa finish last week I went and found. Halloween sampler started many years ago. Maybe it will be delighting the little spooks that come to call this year!